Well, we are certainly in between seasons as far as fashion goes. Retailers know we’re not quite ready for Spring fashion yet (especially here in the southern states) but high Winter has well and truly come and gone. And that’s why the stores are suddenly full of very excellent basics for trans-seasonal dressing. 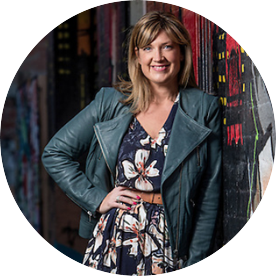 I’m talking long sleeved tees, jeans and denim skirts, simple blouses and plenty of black, navy, cream and white for corporate and every day wardrobes that need freshening up. In amongst all of this, I’ve noticed a proliferation of stripes: striped tops, knits, dresses, skirts and pants everywhere. And it’s always a good thing to see. Flattering, interesting to the eye and easy to wear, stripes are a great addition (I’d even say basic) for any wardrobe. So in today’s post, I’ve rounded up sixteen new season stripey numbers from luxe to less: eight tops under $70 and eight dresses under $150. 1. Drop shoulder top, $25 from Target; 2. Mini Stripe Scoop T-shirt, $39.95 from Country Road; 3. Relaxed Linen Top, $59.95 from French Connection; 4. Baby Rib Swing tee, $59.95 from Seed Heritage; 5. Retro Stripe T-shirt, $59.95 from Country Road; 6. Stripe linen top, $69.95 from Sussan; 7. Side splice top, $69.95 from Witchery; 8. Stripe Scoop tee, $69.95 from Seed Heritage. As you can see above, as well as the usual (and very versatile) black and white stripes, there are lots of variations on this timeless theme. Try khaki, lemon and navy if you’re after something a little bit different – they all work back well with denim too. Grey and white in particular is a nice combo which works well with distressed denim or posh trackies for easy, every day style. Navy and white stripes evoke the classic French Breton style which always looks a million bucks with denim and simple tan accessories. Duchess Kate is all over this, wearing it simply but brilliantly. 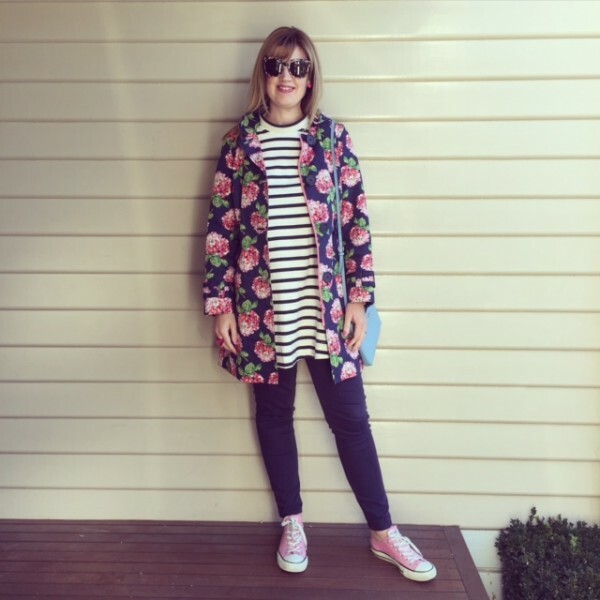 I like to work my navy and white stripes with some leopard print, as above, for some print clash action (for tips on how to print clash like a boss, check out this post). 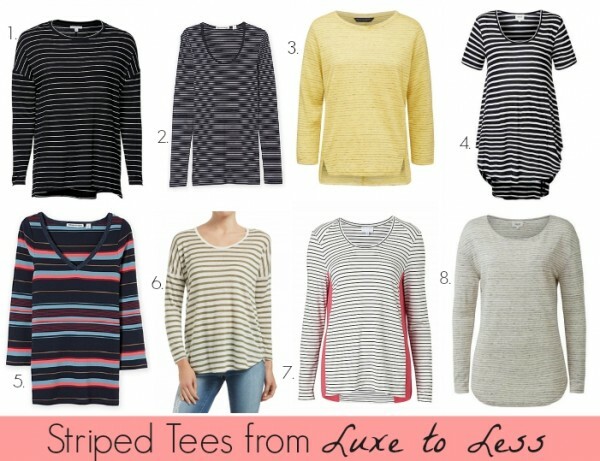 There’s also considerable variation in the style of new season striped tees too, from fitted styles (2 and 5) through to drop shoulder boxy styles (1 and 6), casual throw over styles (3 and 8), longer tunic styles (4) and dressy, spliced styles (7). With so much choice around, there is bound to be a style, cut or colour to suit everyone. 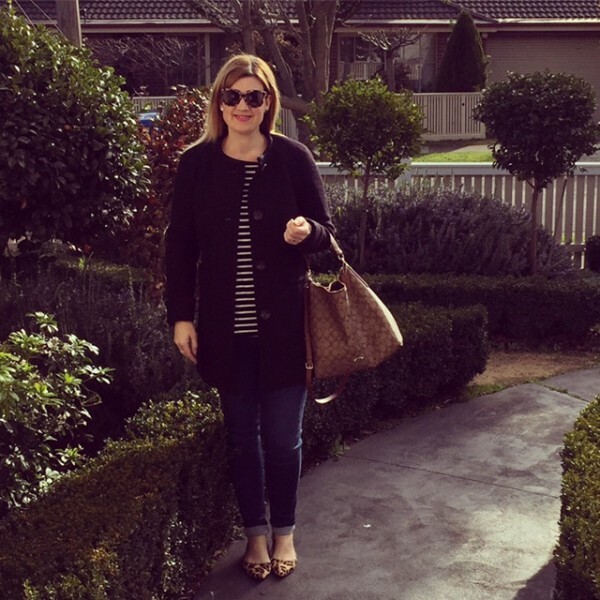 I generally prefer a looser striped tee to wear over jeans but I also like to wear a more fitted tee tucked in to a denim skirt or over a pair of ponte pants with a long cardy over the top. 1. Midi dress – blue stripe, $25 from Target; 2. Striped Midi dress, $89.95 from French Connection; 3. Fiona Stripe dress, $99.95 from Decjuba; 4. Navy Metallic Stripe dress, $99.95 from Witchery; 5. Phoebe Stripe dress, $109.95 from Decjuba; 6.Karlie Stripe dress, $129.95 from French Connection; 7. Stripe dress, $129 from Country Road; 8. Bold Stripe Wrap dress, $149.95 from Witchery. Likewise with dresses. 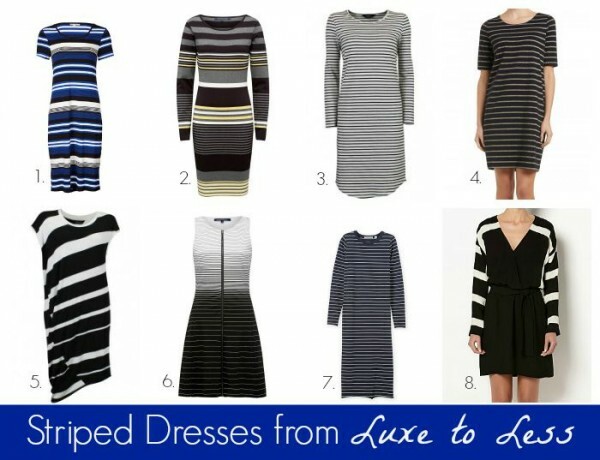 I’ve lost count (ok, I don’t really want to count) of the number of striped dresses in my wardrobe. I keep buying them because them because they just work. I throw on shorter styles over skinny jeans with trainers like this. Above, I’m wearing the Oui Non dress – yes it’s very short – by Gorman from earlier this AW15 (now sold out) but you can still shop the Oui Non boxy top here. More casual styles (like 1, 3 and 7) work with trainers or ballet flats now and sandals later. Dressier styles (4, 5, 6 and 8) just need a simple block heel or pointed pump and a bright lip. Don’t be put off by body con styles like (2) either. Not many of us would feel confident wearing them on their own but with tights, a pair of heeled boots and an oversized cardy or sleeveless coat, this would look super chic. I couldn’t resist the mix of stripes and metallic in this Sussan dress (4) which I’ve already bought and can’t wait to wear when it warms up. If you love this stripe/metallic combo too, check out the new range of striped tops with silver or gold spots at Sussan. For more ideas and inspo on how to wear stripes, check out this post. * This post contains affiliate links. You don’t pay any extra but I earn a small commission. For more info, check out my disclosure policy here. Are you happy to see all the stripes around? What’s your favourite colour combo or style?